Pamela Sakowicz Menaker is the Communications Partner at Clifford Law Offices. As an attorney with two degrees in journalism from Northwestern University’s Medill School of Journalism, Pam combines her experience in these two fields in handling the press in the many high-profile cases handled by the firm. For instance, Pam was involved in the month-long trial of internationally-acclaimed violinist Rachel Barton who was severely injured by a Metra train. The case drew front-page headlines and daily television coverage in what has been described as the most publicized civil trial in the history of Cook County. It resulted in a $35 million verdict that was upheld on appeal. Pam is involved with numerous clients from the initial filing of a case to the final settlement of the matter. She routinely conducts press conferences so that an organized, considered approach to high-profile matters can be presented that ensures the clients’ rights are protected. Other cases for which she has handled the press that drew national media attention include the fire at the Cook County Administration Building, the scaffolding collapse at the John Hancock Building, the porch collapse in Chicago that killed 13 and injured dozens of others, the Union Pacific derailment that led to a bridge collapse killing a Chicago suburban couple and most recently an international press conference held in Boston involving seven of the eight circus performers who were injured when a “human chandelier” act collapsed in Rhode Island during a Ringling Brothers performance. Pam also has been involved in handling the press involving Girl X, a girl left for dead at a Chicago housing project; Michael Chambers, who was killed by off-duty officers at a wedding in south suburban Countryside; Bob Collins, the popular WGN radio personality who was killed in a small plane crash; Nancy Clay, who was killed in a high-rise fire when Chicago firefighters were unable to reach her; and every major commercial airline crash in the United States over the past decade in which Robert Clifford has been involved. Pam’s background is grounded in journalism. Her experience includes every type of media outlet. Upon graduating from Northwestern, Pam worked as a reporter for the Chicago Tribune. She then moved to ABC-TV where she worked for the local affiliate in Chicago as a writer/producer for the local news. She also created the column Prelude in N for North Shore Magazine which she wrote for two years for the popular magazine. She has been a Washington correspondent and political speechwriter in the nation’s capital as well as a producer/writer for Tribune Entertainment and the New York Times Corporation where she worked on a pilot for a news magazine program. Pam has taught as an adjunct professor at Northwestern University’s Medill School of Journalism where she taught writing to graduate students and assisted in teaching Law of Journalism to undergraduates. Most recently, Pam is an adjunct faculty member in the Integrated Marketing and Communications Department of Medill where she teaches “Law, Policy and Ethics of Marketing”. Pam also has been very involved in legal writing since her graduation from Loyola University School of Law in 1984. Having been the first night-law student selected to compete on the school’s Moot Court team, while still a student Pam argued a case before the Seventh Circuit Court of Appeals in her Appellate Practicum class. After being sworn in as an attorney in Illinois, she later appeared before that court as a pro bono attorney representing criminal defendants for the Northern District of Illinois. She also was selected as an extern attorney and worked in the Cook County State’s Attorney’s Office, Consumer Fraud Division, where she was introduced to issues of consumer fraud. In 1991, she continued her brief writing for Clifford Law Offices as well as handling of the press on high-profile cases that grew until her appointment in 2001 as the firm’s Communications Partner, which recognizes her journalism as well as her legal experience. She is also involved in various bar associations including the American Bar Association where she was a member of leadership serving on the Task Force for Young Litigators and as a member of the Standing Committee on Strategic Communications. She was appointed by the ABA President to serve on the Human Trafficking Task Force for two years. 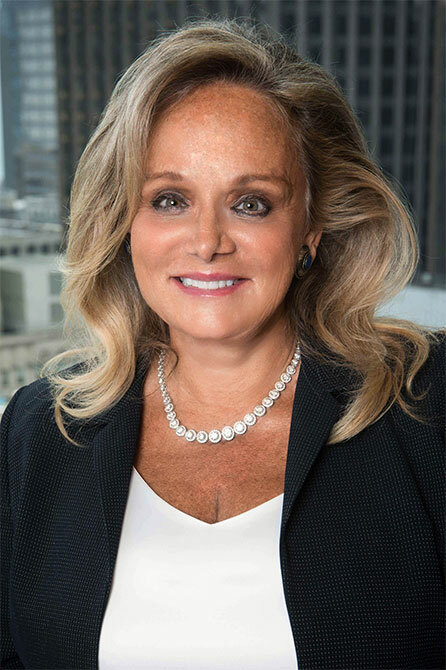 She also was Co-Chair of the Section of Litigation’s Written Materials Committee, She also served as an Editor on the ABA’s Litigation Magazine and Litigation News that is distributed quarterly to the section’s 60,000-plus member section. She also served as Co-Chair of the Annual Meeting in Chicago in 2005 and again as a member of the Host Committee in 2015, helping organize the dozens of programs and written materials accompanying the continuing legal education seminars. Pam currently serves on the Illinois State Bar Association (ISBA) Board of Governors, serving a three-year term. She was appointed as liaison to four committees: Attorney Registration and Disciplinary Committee (ARDC), Legal Technology, Bar Journal Editorial Board and Standing Committee on Delivery of Legal Services. She also was elected by the Board to serve on the Standing Committee on Scope and Correlation (SCOPE). She was elected to two terms on the ISBA Assembly, representing Cook County. She chaired the ISBA Ask-A-Lawyer Day (2016) and Co-Chaired the IBF’s Host Committee Annual Gala (2006). Menaker served on the Host Committee of the 120th Anniversary of “30 Female Blackstones” (2013) at the request of the ISBA President. Pam was selected in 2006 to serve as the Co-Chair of the Host Committee for the Illinois Bar Foundation’s Annual Gala Affair. The annual event, designed to raise hundreds of thousands of dollars which ultimately is used to benefit the dozens of pro bono legal organizations around Chicago, is an event that attracts hundreds of lawyers who also are committed to furthering the philanthropic goals of the charitable arm of the Illinois Bar Association. She also has served a number of years on the Illinois Bar Journal, the publication of the ISBA that goes out monthly to its thousands of members across the state. She has served as liaison to its Marketing and Communications Committee as well as liaison to its Human Rights Committee while serving on the Board of Governors. Pam was elected to a two-year term on the Chicago Bar Association (CBA) Board of Managers from 2016-18. She has served on the CBA Editorial Board, the Chicago Bar Record, since 1985, serving as its book review editor from 1995 to 2016. In 2006, she was appointed to serve as Co-Chair of the CBA/Chicago Bar Foundation Pro Bono Week Committee, which was marked by the Chicago mayor and the Illinois governor proclaiming it a special week in October in recognition of the efforts of the CBA and CBF, the charitable arm of the CBA, in raising the awareness of lawyers’ pro bono efforts in Chicago and around the state. She also served on the CBA Judicial Evaluation Committee and its Public Affairs Committee. Currently, Pam spearheads the continuing legal education programs at Clifford Law Office She was a member of the Center for Conflict Resolution and the Public Interest Law Initiative (2016-18). Pam has been an active member of the Catholic Lawyers Guild of Chicago and will ascend to President of the organization in May 2019. She also serves on the Board of Governors of the Advocates Society of Polish Lawyers. Continental Casualty Company v. Great American Insurance Company, 711 F. Supp. 1475, 432 F. Supp. 929, 438 F. Supp. 1170 (N.D.Ill.1990). Represented Plaintiff before Judge Brian Duff in the Northern District of Illinois, transferred to Judge George LaPlata in the Eastern District of Michigan. Ranger Insurance Company v. Home Indemnity Insurance Company, 714 F. Supp. 956 (N.D.Ill.1989). Represented Defendant before Judge Marvin Aspen in the Northern District of Illinois. Successful in defeating the Plaintiff’s bad faith motion. Machline vs. National Helicopters, et al., Case Number: 96 Civ. 5999 (LBS), U.S. District Court, Southern District of New York. Brazilian entrepreneur and his wife are killed in helicopter crash. Settled $10 million, March 28, 2007. Levenberg et.al. v. McDonnell Douglas, et.al., 93 L 4325 (1989). Choice of venue motion. United Airlines Flight 232 cartwheels down the runway in Sioux City, Iowa, killing 112 and injuring 184 others. Consolidated cases in U.S. District Court, Northern District of Illinois. $28.3 million verdict on behalf of Plaintiff Doris Levenberg, 1994; Settled $15 million, Plaintiff Terry Brown. United States v. Rodriguez, 831 F.2d 162 (7th Cir.1987). Affirmed. Weber v. Israel, 730 F.2d 499 (7th Cir.1984). Affirmed. Ainsworth Corporation v. Cenco Inc., 158 Ill. App.3d 639, 511 N.E.2d 1149 (1st Dist.1987). Represented Plaintiff-Appellant. Reversed and remanded. Knapp v. Palos Community Hospital, 176 Ill. App.3d 1012, 531 N.E.2d 989 (1st Dist.1988). Represented Plaintiffs-appellants. Affirmed in part, reversed in part. Kaput v. Hoey, 124 Ill.2d 370, 530 N.E.2d 230 (Ill.1988). Represented Defendant-Appellate. Affirmed. Graphic Sales v. Sperry Univac, 824 F.2d 576 (7th Cir.1987). Represented Plaintiff-Appellant. Affirmed. Lee v. Grand Trunk Western Railroad, 143 Ill. App.3d 500, 492 NE.2d 1364 (1st Dist.1986). Represented Plaintiff-Appellant. Affirmed. Blagg v. F.W.D. Corp., 143 Ill.2d 188, 572 N.E.2d 920 (Ill.1990), on behalf of Plaintiff-Appellant. Tell Us About Your Case Get your FREE, confidential case consultation today! © 2019 by Clifford Law Offices PC.